Tony’s willing to offer you a slice of the pie If you can match up the paylines and increase the size of his pizza empire in this cheesy 5 reel online slot game. Help Tony find extra toppings by matching Wilds and Scattered Pizza Symbols and you may be able to unlock the bonus oven mystery feature. NextGen was established in 1999, just in time for the birth of the online casino industry which has changed and shaped the way we gamble forever. With over 20 years of experience in this industry, NextGen has established itself as being one of the most reputable developer of premium online gaming solutions and serves a worldwide market place. Their games are not only profitable for their operators, but also give their players an entertaining and enjoyable gaming experience, no matter where their games are played. You know what they say, never trust a skinny chef. Tony is a man who enjoys his pizza, and who can blame him with such delicious toppings. 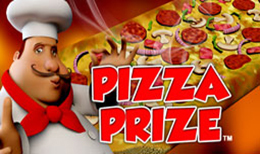 He owns his own Pizzaria, but he needs your help in this fun online slot game. He loves his little restaurant so much that he would love to give you a slice of the action and is willing to offer you a serious share of the profits just for helping him out. Tony needs you to help him find loads of extra toppings, mountains of pizza dough, and because his food is so good he needs even more delivery boys to keep up with demand! You have 5 reels and 25 paylines to play with, and bets start at 1p up to £50 per spin. Every symbol that is on the reels is dripping in toppings, even the lower value playing card symbols. Find 5 matching symbols of any 9, 10, J, Q, K will win you 5 – 200 times your stake. Pepperoni and vegetables will reward you with 200 times your stake when you find 5 matching symbols on the reels, and 5 lots of pizza dough will give you 250 times your bet. If you can get 5 delivery boys for Tony, you will be rewarded with 500 times your stake! Tony is the Wild symbol in this funny online slot game, and he is such a hard worker that he may even appear on every reel. If that happens you will be rewarded with a whopping 10, 000 times your bet! Tony works very fast though, and sometimes his pizzas scatter everywhere. If you can stop them from hitting the floor he will pay you up to 100 times your bet just for saving him the money and effort of having to create another pizza. If you catch 3 Scattered Pizzas at the same time you will also trigger the Free Spins feature. You will be rewarded with 15 Free Spins where all of your winnings will be doubled! If business is good, Tony may even let you open his ovens for the Oven Mystery Feature. When Tony is on reels 1, 2, or 3 he’ll multiply prizes by either 2x, 3x or 5x, when on the 4th reel he will multiply them by 4x, 5x or 8x and if he is on the 5th reel he will reward you with some free spins. Working in a takeaway restaurant is very busy and fast-paced, but Tony is a great boss and he rewards you well for your hard work in this fun online slot game. The game design is fun and energetic, and full of great pay outs making it a brilliant game from NextGen.